The common name "carpet moth" gives you the impression that this moth is a potential pest, feeding on the rugs, carpets, and other fabrics in your house. A lot of moths have the word carpet as part of their common name, and some of them are household pests. 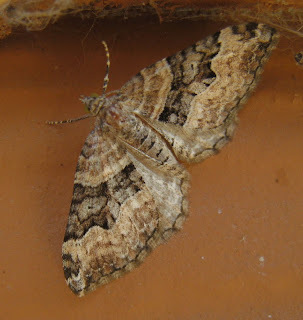 But I think in this case, the word carpet refers to the pattern and coloration of the wings. The "toothed" part of the name apparently refers to the bump in the lower part of the dark brown strip across the middle of the wing. These moths spend the winter as pupa, emerge in the early spring, lay eggs and feed as caterpillars until the early summer. Then they pupate and emerge for a second generation in mid to late summer. The caterpillars feed on a variety of plants.